Brrrr it’s cold in the Shenandoah valley! So we’re eating lots of soup. It’s warm and comforting, it’s easy to make a big batch and freeze some of it for a rainy day, and it’s a great way to use up some leftovers. Do you like to meal plan? What’s your strategy? I’m all about creating habits that simplify the process of making healthy meals, so that I’m more likely to do it! Very rarely (if ever) do I see a fancy recipe with ingredients I don’t usually buy and won’t use for other meals, and go out of my way to add these to my shopping list. It’s just not how I roll. My shopping list usually says “meat” and “veggies” and I’ll decide at the store which ones look good based on season and sales. And I have staples that I just ALWAYS get, because I know I can apply them to numerous recipes. This way I can buy in bulk and I know it’ll all be used up before it goes bad. Sausage and potato are two of those ingredients. They are always in my cart. Sausages are awesome because you can eat them whole or cut them up and put them in chili, a salad, a taco bowl, or a big batch of soup! Potatoes go quick at our house too. In fact I’ve got a few whole baked potatoes and a big batch of mashed potatoes waiting for me in the fridge right now. So… guess what! 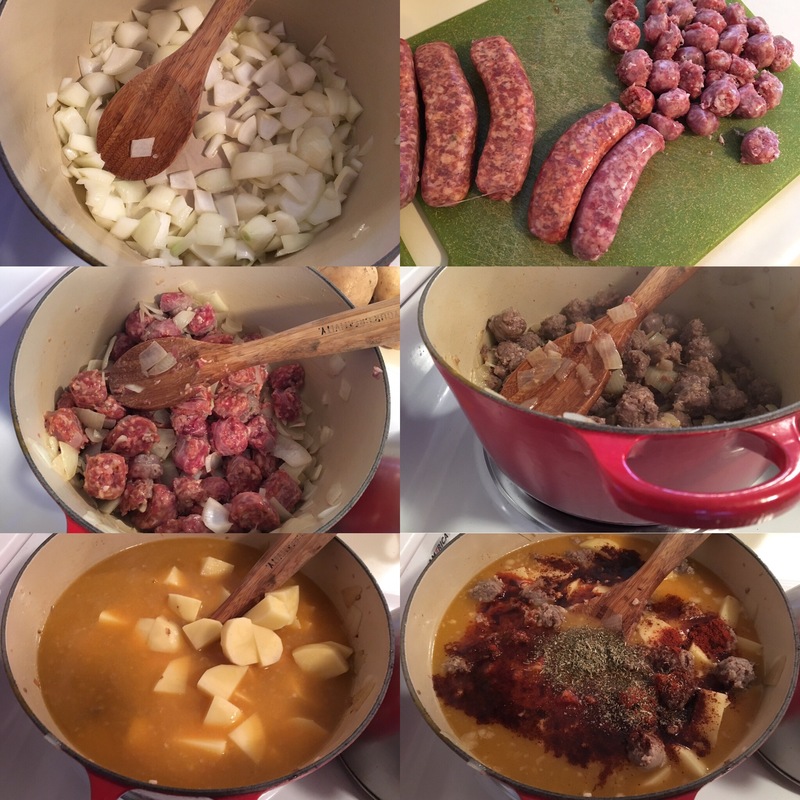 This recipe uses both sausage and potato! 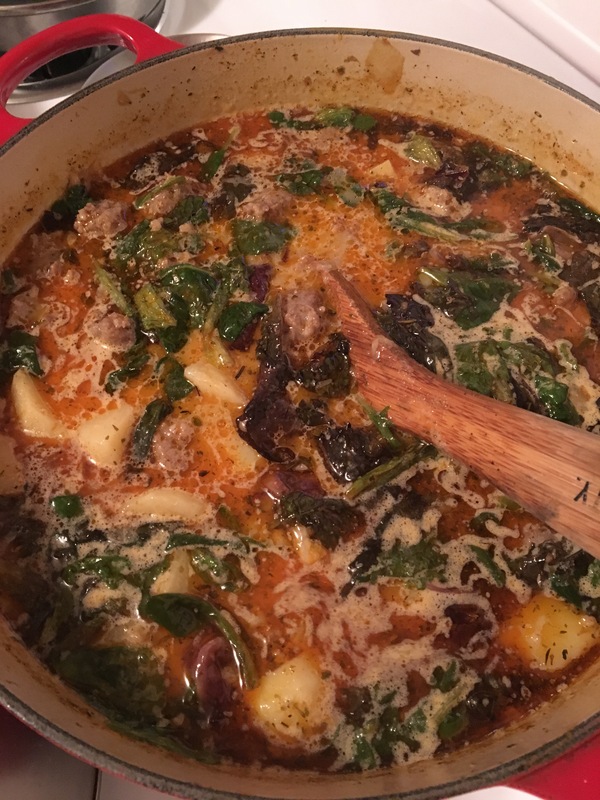 The only other fresh ingredients you’ll need is heavy cream (unless you’re diary free, and then feel free to use a can of coconut milk), and some spinach. The rest of the spinach can be used for a nice little side salad for a complete and balanced meal. 1/4 cup heavy cream or 1 can coconut milk. Add wine, chopped garlic cloves, chicken stock, and potatoes. Water can be used instead of chicken stock. The wine is optional. I don’t taste it in the soup, but I can tell when it’s not there. Once boiling, turn the heat down to medium-low, and simmer for 15-20 minutes. Stir in the heavy cream or coconut milk. Delicious with a big dollop of sour cream! The chili, paprika, and wine give this soup slightly spicy and sweet, deep and rich flavor. 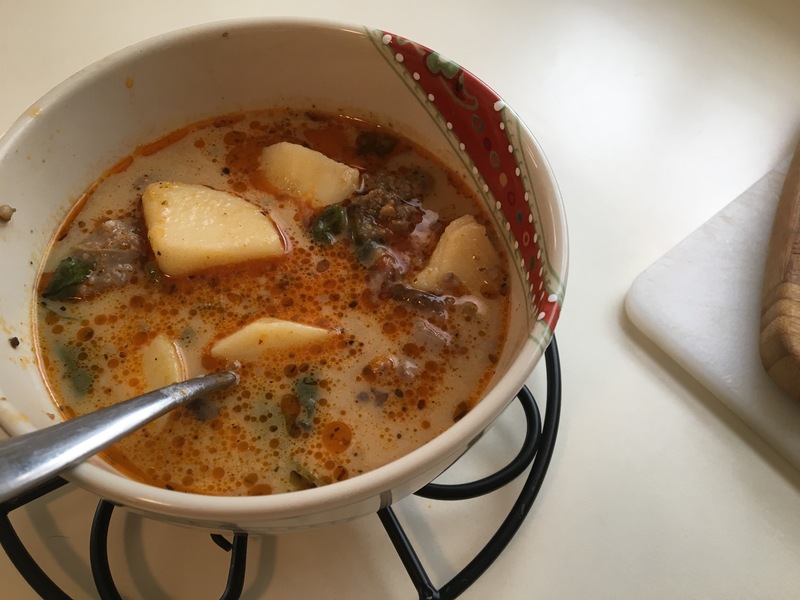 This soup is so hearty that it satisfies even my hungry contractor husband.